There is a need to provide timely assistance to people who run an increased risk of accidents, malfunctioning, diseases, strokes, etc., in particular elderly people, recovering or disabled people and possibly children. The goal is to monitor these people (target group) and their behaviour in order to reduce risks, to avoid accidents, to give preventive warnings, to initiate corrective measures or to ask for assistance, e.g., from nearby “trusted” caregivers. By applying advanced wireless sensor technology, it becomes possible to monitor the health and wellbeing of these frail people, determine their location, and possibly what they are doing. Because a designated representative of such a person, e.g. a family member or a neighbour, is not always available or nearby to provide assistance, there is a need for a solution that allows other qualified and trusted caregivers to take over this role when this is most appropriate. This also includes remote control over specific home functions by a person with a high trust-level, again, typically a close family member, which may assist the person in need to perform certain tasks, and the ability to check to which extent nearby caregivers have access to the personal and health data of the person in need and to which extent they are allowed to help them (e.g. access to home, access to drugs). Provide solution for secure trust-based delegation in assisted living and community care. Provide solution for automated context derivation for resident as well as potential responders. Demonstrable system supporting community care for frail elderly people involving dispatching a responder, in case help is needed, in a trustworthy way. The demonstrator includes the trust-based delegation and automated context derivation methods. Demonstrable methods for trust-based delegation in healthcare scenarios. 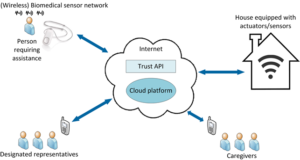 Demonstrable methods for automated context derivation for frail elderly people involving sensor fusion of house-equipped and on-body sensors. Demonstrable methods for automated context derivation for potential responders involving reliable and secure geolocation. Validation results of concepts developed through stakeholder (e.g. focus group) involvement.